At Christmastime, I love to see beautiful decorations—fresh greenery over entryways and windows, wreaths on doors, and trees bright with lights and ornaments. While there are beautiful homes all over the country this time of year, you know I have a special place in my heart for a gorgeously decorated Southern home. 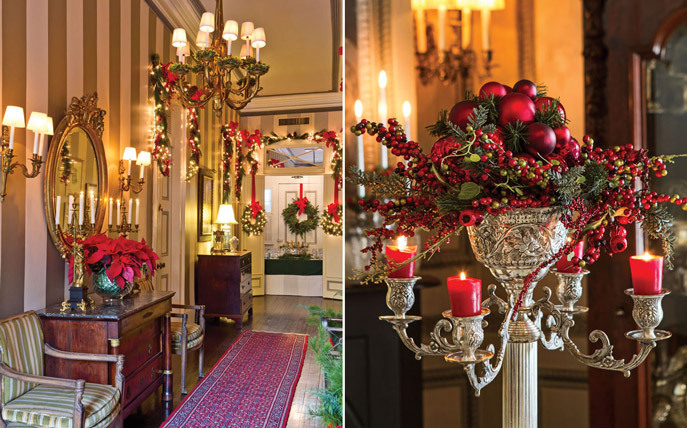 This year’s Holidays special edition of Southern Lady captures an iconic Southern home that I couldn’t resist sharing with you. Lauren Brennan Brower’s New Orleans home is simultaneously elegant and welcoming. A classic French Quarter abode, it features the personal touches of a family home passed down for generations while also featuring elements of classic style sure to inspire those with the most refined tastes. If any of you love the culinary experience of New Orleans, then you’re no doubt familiar with the Brennan family. Building a legacy that their father began with the highly esteemed Commander’s Palace, Lauren and her brother, Dickie, now oversee four restaurants, including Palace Café, Dickie Brennan’s Steakhouse, and Dickie Brennan’s Bourbon House. Lauren graciously allowed our photographers to capture her lovely home—the same family home where she and Dickie grew up. 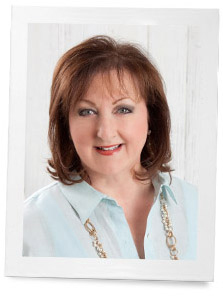 Considering its beauty, it is no surprise that she focuses on shaping the décor and overall ambience of her restaurants as well. 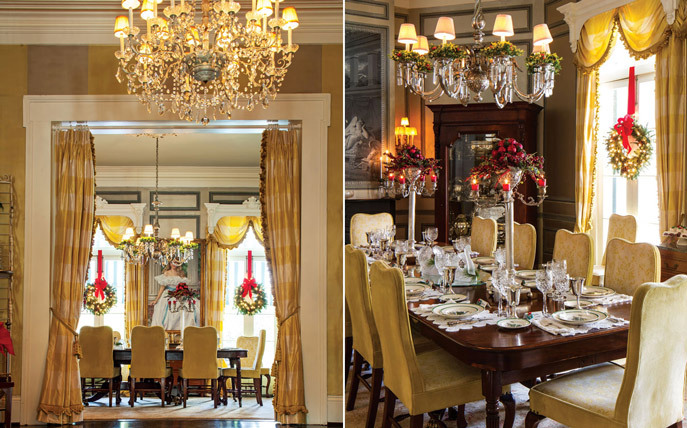 I couldn’t resist sharing a peek inside this New Orleans home from the pages of Southern Lady Holidays. Elegantly appointed, this historic home was made for entertaining. In the dining room, tall candelabra and Christmas Tree china by Spode say this is a special occasion. Simple rings of greenery and berries give the chandelier a bit of pizzazz. The details of the décor carry special meaning for the family. Lauren explained that following Hurricane Katrina, while water damaged much of their property, they successfully saved and preserved the yellow silk curtains found in the living and dining rooms. In the air there’s indeed a feeling of Christmas—with a little help from white lights, holly berries, poinsettias, candles, and a collection of caroler figurines. Windows and mirrors bear beautiful wreaths, and velvet ribbon adds to the timeless appeal of this décor theme. In the kitchen and family room, the look remains festive but is more relaxed to suit the spaces. Handmade stockings and a large tree bedecked in happy hues play up the familial feel, while felt place mats, casual-themed motif dinnerware, and napkins embroidered with toy soldiers only add to the merriment. Stylized angels in gold flank the fireplace, and an antique dough bowl filled with fresh fruit nods to holiday traditions of years past. 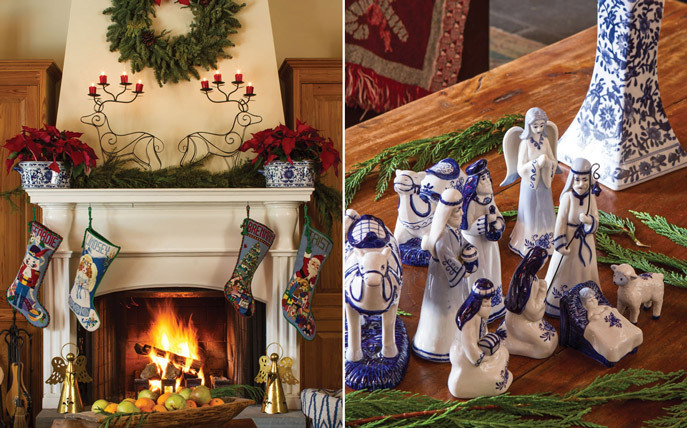 Coordinating with the homeowner’s collection of blue-and-white pieces is a tiny Nativity in the same hues to round out the classic holiday displays. 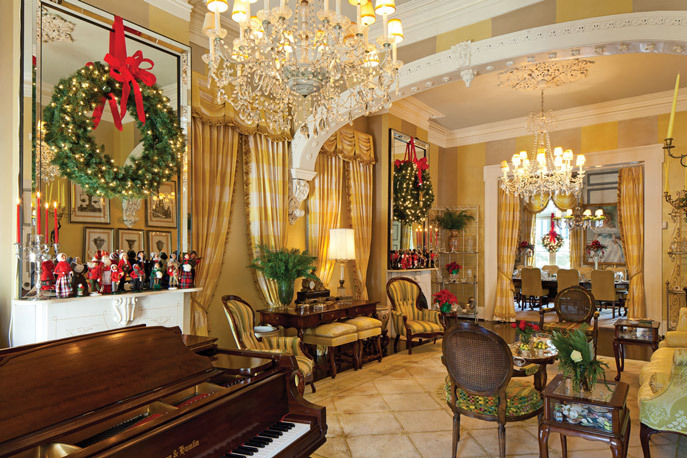 Find more festive and beautifully decorated Southern homes in Southern Lady’s latest special edition. 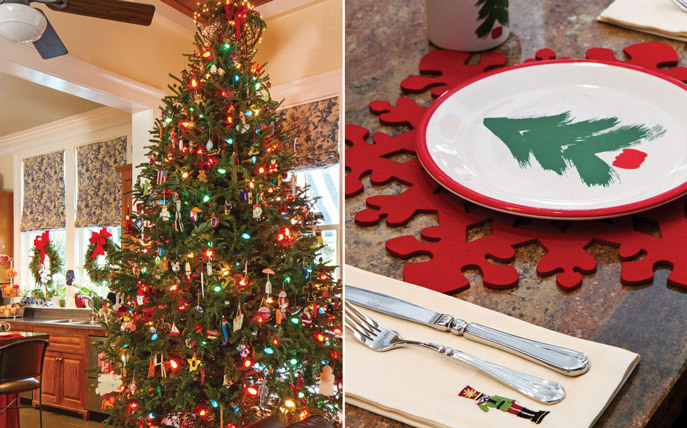 What inspires your Christmas décor? Totally cute Katie! Sending a link to this post to my gluten-free and vegan neice. She will love these! I like the cinnamon spice one, maybe because its autumn. Style masquerading as substance. Wrong masquerading as right. Evil masquerading as good. While pursuing their less obvious agendas. It is true about spammers. It is true about modern day Democrats. And sadly, it is also true about many modern day Republicans. Anyway, good luck including spammers to anything of value. I am not so sure i would risk using a sharp metal fork with bare feet. I would probably stab myself in the foot, AGAIN! Believe it or not it would not be the first time (of course, i was wearing boots at the time). I remember my big toe swelled up like a balloon. Heck of a job there, it abluostely helps me out. The reason for the season inspires my décor! After years of decorating I have my husband pull a few boxes from the garage and I work with what he gives me and its always a surprise as he rotates the boxes of Christmas decorations. I do elegant place settings complete in the dining room and in the kitchen I usually do a red plaid design with place mats and fun Christmas plate ware. I have several different dish sets that I also rotate from year to year. Use scented candles in all our rooms and it just transforms into a Holiday splendor for us….Its a feel good feeling about loving the holiday to celebrate the birth of Jesus. I am the fortunate one to posses the old family crèche which was put together by my older brothers when they were very young. My oldest brother built the stable with help from a teacher. Both brothers saved their nickels and dimes and bought the precious figures at the dime store. Starting with the holy family additional figures were added each year. I cherish each chipped figure as I remember those small boys who lovingly created the heart of our Christmas celebration. All that glitters and shines has my attention. Memories of my mother’s tasteful Christmas decorating is the point from which I start pulling it together. Love Santa’s, tartans, reds and golds, with green and silver tweaking. Also, love the unexpected. Ultimately, I decorate for the holidays to celebrate the birth of my savior, and to make it magical for my family and friends. Thanks to Hoffman Media, your editors and photographers, I’m never at a loss for inspiration!